Media | i like you. The ever-colorful Wendy O’Sunshyne leads the equally colorful band, i like you. 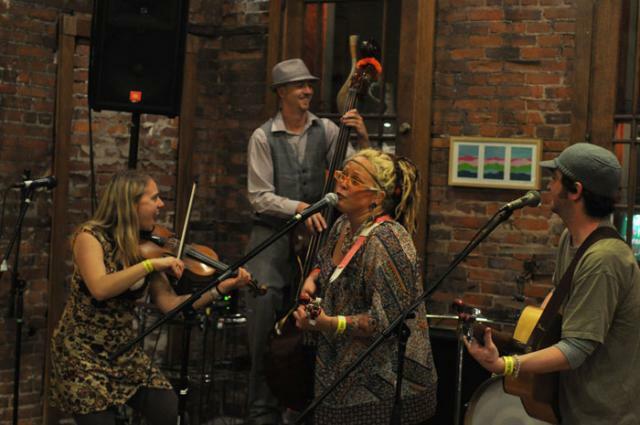 The band features a unique and energetic blend of vocals, percussion, guitar, violin, trumpet, upright bass and of course, ukulele. Here, the group performs their lively song New Beginning in Brant Kingman’s North Minneapolis studio. From kazoos to ukuleles to whistling and acapella harmonization, i.like.you. 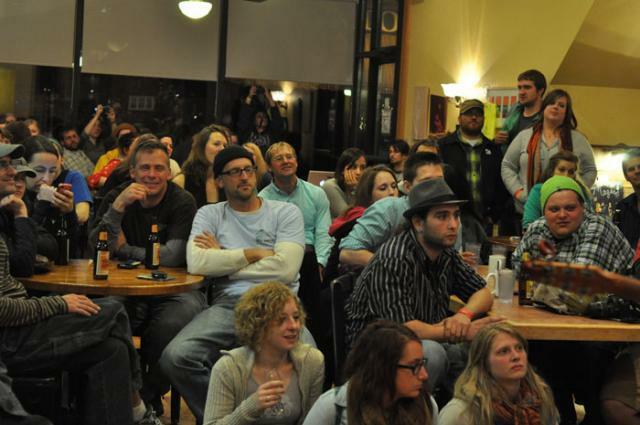 is pulling out all the stops at the Acoustic Café Saturday night during Mid West Music Fest. Many strangers shared tables as they munched on their sandwiches and bobbed along to the bubbly beat of the band’s tunes. “I’m really glad that they have the chance to have a real audience,” said Ross Blondell, a Winona resident and regular attendee of the fest. Last year the band was stationed at the Earth Day festival where they performed for mostly parents and children. The three-year-old band, which has performed at Mid West Music Fest since the festival’s birth, is a combination of folk and indie original tunes off their first ever recorded cd, released on March 3rd. They are different from most because of their unusual combination of instruments. Their songs contain music from an acoustic guitar, a ukulele, drums, a violin and an upright bass. Wendy O’Sunshyne, lead singer and ukulele player, stands on stage with multi-colored dreads and neon orange glasses and facepaint mezmorizing the jam-packed café. From audience members swaying as they stand throughout the café to heads lightly bobbing, there is not a still body here. The Winona community celebrated Earth Day as they put on their dancing shoes to groove to the unique sounds of I Like You. The band I Like You started nearly one and a half years ago and has worked its way up to playing in a variety of festivals around Winona, including winning Battle of the Bands last night. Wendy O’Sunshyne let her ukulele pave the way to writing her songs and, combined with her original voice and talented group of musicians, formed the band I Like You. The band formed itself, said O’Sunshyne, as members collectively discovered each other through festivals and friendships. One member, Joe Sheehan, bought an upright bass and learned to play by coming to rehearsals with the group. But the name I Like You, though clever, was not easy to come up with. “In a moment of exasperation, I thought about what I wanted to convey and ‘I like you’ was what I came up with,” said O’Sunshyne. The band really enjoyed the title and theme and, from then on, it stuck. “It’s a great pick-up line,” said David Hutther, drum kit and djembe player in the band. The bands popularity is no doubt due to its unclassifiable sound, straying away from the mundane. “It sounds like something brand new, but something so familiar at the same time,” said O’Sunshyne. The Earth Day Festival goers bobbed their heads and shook their feet as I Like You performed their original catchy tunes. “We like you,” shouted O’Sunshyne as they ended their set and fans applauded and cheered, disappointed that the set came to a close.